Building the Erie Canal Was Messy: It's Worth Remembering That! The iconic Erie Canal is one of those pieces of Americana that exists today largely in the imagination. The Brooklyn Bridge, which joined Manhattan and Brooklyn in 1885, or the Panama Canal, which joined the Atlantic and the Pacific oceans in 1914, are experienced today much as they were built. The original Erie—just forty feet wide and four feet deep by 363 miles long--which in 1825 joined the Hudson River to Lake Erie and thus the Eastern seaboard with the vast unsettled continental interior, has not existed since a substantial enlargement completed on the eve of the Civil War. The current and third incarnation of Erie, completed in 1918 and ingloriously dubbed the New York State Barge Canal (until recently), is a broad, deep channel for motorized craft, nearly all of them now pleasure boats. Wooden barges heavy with pioneers and pioneer commerce, pulled by mules along rutted towpaths, are a century gone. Typical of mythic things, little new thinking has been applied to Erie for a good long while. Frequent juvenile and occasional adult histories retell warmed over stories. The same good long while has seen the decline of American infrastructure, of which the original Erie Canal was the overachieving firstborn. The canal is undergoing a mini renaissance of sorts rights now. Calls for the creation of a national infrastructure bank to build and (mostly) rebuild roads, bridges, rail lines and other infrastructure cite Erie as the paradigm for American infrastructure creation. Erie can serve as an example of American resolve and ingenuity—it was designed and built by amateurs through unbroken, disease-plagued territory with crude tools, high casualties, and speculative financing—but little about its actual creation can serve as a model for 21st infrastructure. In fact, blind invocations of the great canal in service of contemporary needs can lead to frustration. Idealizing the past makes the future more difficult: How can we possibly measure up? When the things we’re trying to (re)build now run up against confounding financial, legal, and environmental realities, how do we go forward with confidence lamenting that things were much easier in the past? The answer is that they weren’t. It is not generally acknowledged that Erie was a messy thing. But it was, in many ways. The canal was proposed in anonymous newspaper essays by a bankrupt merchant in debtors’ prison. If his anonymity had been lost, the busted dreamer’s wild notion of a canal across the breadth of upstate New York would likely have been fatally scorned. Benjamin Wright, the country surveyor who emerged as Erie’s chief engineer (and is honored today as the Father of American Civil Engineering), was nearly fired for avoiding hazardous Erie fieldwork and neglecting his Erie work generally for outside jobs. His peers also didn’t like him very much. Conflict of interest was an unborn term in Erie’s day. Men who served as Erie canal commissioners and engineers pursued healthy speculative profit in remote lands made more valuable by the canal’s passage. Money was also wasted trying to save money. The spectacular aqueduct carrying the canal over the raging Genesee River at the new village of Rochester was hailed upon its completion in 1823 as “a structure of admirable solidity and beauty” and “the most stupendous and strongest work in America.” Ten years later, the country’s longest stone bridge was “in a state of rapid dilapidation.” In another three years, it was “nearly in ruins.” Why? Against engineering advice, the canal commissioners had ordered the aqueduct built of local but soft and porous sandstone; a new aqueduct of proper but expensive limestone had to be built alongside the splendid wreckage of the first. The canal was an instant success in generating wealth for the state (largely via tolls) and for the nation generally in moving people and manufactured goods west and produce and raw materials east, but it was too small. Just nine years after the canal opened, chief engineer Wright admitted: “in the size of our canal . . . we have made great errors, very great indeed.” The original canal cost $7 million; the tab for the enlargement (to seventy feet wide and seven feet deep) over the next three decades was $43 million. Erie was a fantastic success (despite the cost of two constructions) but its success induced many more failures. The Panic of 1837 and the ensuing six-year national depression were fueled by a collapse in financing for Erie-inspired state and private canal projects that never should have been started. Erie was the herald of the nation’s first technology boom and bust. The point is not that Erie was a terrible boondoggle. It was not. By joining east to west, Erie was the first bond of a continental union. The point is that it was an extraordinary risk with real negatives that were overwhelmingly minimized by extraordinary positives. Two centuries later, we’ve become a risk-averse nation. Fearful of catastrophic failure, our greatness slowly ebbs. We deteriorate by a thousand small failures. But, if we recognize the past as having been as messy as the present, we can set realistic and hopeful goals for the future: it becomes easier to do better. I have now read Mr. Koeppel's book, and have posted a review of it at Amazon dot com, which is on the whole quite favorable. 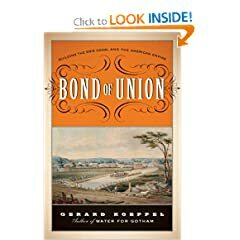 "Bond of Union" is a valuable reference, despite the fact it underestimates Benjamin Wright. It seems clear the canal would never have been completed if they had started with the eastern leg instead of the central section. One wonders whether the commissioners and Mr. Wright did not begin with the central section precisely because they feared such a problem. When writing his book, which I have not yet seen, I wonder if Mr. Koeppel had the benefit of Benjamin Wright's long discussion of his role in building the canal a letter dated Dec. 31, 1828 to David Hosack, M.D., which was copied (at pg. 500) in the Hosack's "Memoir of DeWitt Clinton, published by J. Seymour, 49 John Street, New York, in 1829? I feel that Benjamin was a bit more than a "country surveyor." His father and grandfather were Yale graduates, and Benjamin spent three years studying at Litchfield CT, one of the highest centers of learning in the country. After the Erie Canal, he went on to build the Delaware and Hudson Canal in 1825-1828, and after that many other major projects. He was for several years the most able civil engineer in North America, and the runner-up had been his pupil. You say he did not get along well with people, but he was elected and reelected to the state legislature on the Burr ticket, was appointed Judge of the Common Pleas Court of Oneida County, and was later elected Street Commissioner in New York City. In New York there was great nonpartisan admiration for his accomplishments with the Manhattan sewer and water systems, and also for the Macadamizing of Third Avenue, apparently the first street in Manhattan to be paved. The letter to Dr. Hosack tells us he had enjoyed the full support, years earlier, of such heavyweight Jeffersonians as Albert Gallatin, and such staunch Federalists as General Philip Schuyler, (Washigton's friend and Hamilton's father-in-law), and Gouverneur Morris, the peg-legged Founder who was author of the Preamble. Also, he had the crucial support of New York's Federalist/Populist Governor, DeWitt Clinton. Benjamin's father had been an officer in the Continental Army, and shared Washington's horrible retreat from Long Island... "The Great Engineer" should be thought of as a sophisticated and meticulous man, not a country bumpkin. "The late Mr. Morris, with his gigantic mind and extensive views of things, had no doubt many vast, but crude and indefinite ideas of a great future of improvements in this country. Yet with all his great mind, his projects were of little benefit to the world without being submitted to the test and scrutiny of sound practical minds, to decide upon what was capable of being performed with reasonable feasibility, as to means and future usefulness and profit. The time I hope is rapidly approaching, when sound practical knowledge and judgment, in comparing utility and advantages with expense of execution in great plans, will be better understood and appreciated, and more in fashion than heretofore." Thanks for a great article. The book was great too! There is much to be learned from the Erie Canal.